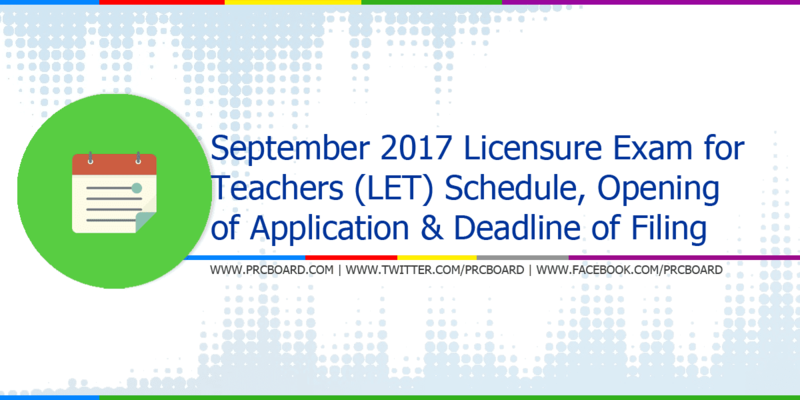 Manila, Philippines - The Professional Regulation Commission (PRC) announced the schedule of application, deadline of filing as well as requirements for application in September 2017 Licensure Examination for Teachers (LET). The board exams for teachers will be held on Sunday, September 24, 2017 at various testing centers in Manila, Zamboanga, Bacolod, Antique, Pangasinan, Laoag and all Regional Offices nationwide. PRC likewise designated additional testing centers upon requests of several Local Government Units (LGUs). September 2017 LET will also be held in Mamburao, Occidental Mindoro; Calapan City, Oriental Mindoro; Odiongan, Romblon; Kidapawan, Cotabato; Boac, Marinduque; Virac, Catanduanes; Puerto Princesa City, Palawan and Masbate City. Below is the detailed schedule for September 2017 LET as per PRC Resolution number 2016-1019 series of 2016 entitled “Schedule of Licensure Examination for the Year 2017”. Update: PRC extended the LET application for Cebu and Tacloban offices to July 21, 2017 (Friday) due to rotational brownouts in Cebu and power outage due to earthquake in Tacloban. Applicants are advised to submit their applications through the Online Application System of PRC. As prescribed by RA No. 7836 as amended by RA 9293, a citizen of the Philippines or an alien whose country has reciprocity with the Philippines can apply. The applicant is of good moral character and good moral reputation with moral values, has not been convicted by final judgment by court for an offense involving moral turpitude. For Teachers in Secondary Grade: A bachelor’s degree in education or its equivalent with a major and minor and the degrees which shall be considered equivalent must have to take at least 18 units in Professional Education, or a bachelor’s degree in arts and sciences with at least ten units in professional education . For Teachers in vocational and two-year technical course: A bachelor’s degree in the field of specialization or its equivalent, with at least 18 units in professional education. The requirements and details posted above are based on the table of qualification and documentary requirements to accompany an application to take licensure examination courtesy of the Professional Regulation Commission. The most recent LET was held last March 26, 2017 at Regional Testing centers nationwide. 5,600 elementary teachers out of 53,915 (10.39%) and 18,482 secondary teachers out of 72,584 (25.46%) successfully passed. Results are released after forty (40) working days. On September 2016 Licensure Exam for Teachers, 23,378 elementary teachers out of 77,466 examinees (30.18%) and 31,334 secondary teachers out of 92,754 examinees (33.78%) successfully passed. To receive fast and reliable news and announcements regarding the aforementioned board examination, we advise our readers to visit PRC official website or follow us at our social media accounts via Facebook and Twitter. Is it possible for a Biology Graduate to take part in the LET?? Mga ilan pong education units dapat ang kunin po pra po maging qualified s LET? pg nag method po then mkakuha atleast 18 units pwd na po mg LET. Atleast 18units po kasi pag prof. Education. For non-educ degree holder with 30 educ-units, should both tor be marked "for BOARD EXAM PURPOSES"? How can i cancel my online application? Does the application valid if the examinee apply online in central office but due to circumstances only able to finish registration in regional office? by application, you mean the online app (adding basic info) only or including the selection of transaction online with requirements and payment? Yes, it is okay to take it. It is as long as you are an Educ graduate or someone who took at least 18 units of professional education courses (CPE). What if I have eyeglasses in my scanned picture in my TOR? Is it okay? As long as the one used in application form is without glasses? Thanks for those who will answer. I'm a BEED graduate.I just wanna ask f it is ok that the marked of my tor is " for General Purposes "
No. It should be marked with "For Board Examination Purposes only"
I am a first timer to apply the requirements for let and I graduated Bachelor of Elementary Education last 2004,is it ok that the marked of my original tor is " for General Purposes "? kailangan talaga galing sa NSO or PSA po..
how about po kung walang akong authenticated birth certificate but I have my NSO Marriage contract, pwede na po ba yun? Authenticated Birth and Marriage Certificate po kailangan. For unit earners do we still use the special order coming from CHED. May pupunta po bang staff ng PRC sa Camarines Norte province for filing? When this will be? Personal ang pag apply sa PRC. No proxy. ganun po ba?..salamat po n marami.. Yes, after taking 18 units of Prof Ed, you may take the LET. r in abroad.where i go to complete this. is it true na meron pong online registration before the filing? I am a graduate in BS Agricultural Chemistry and MA Education major in Science. I am also teaching in college since 1996. Are there other requirements I need to comply if I am going to take Teacher's Board licensure Exam? Pag pinapaayos pa yung NSO birth certificate anong pwedeng ipass para makapag take ng LET? is there any chance po ba naka makapagfile ang mga nasa ibang bansa for september exam ?...hoping for some reply po. Yes,through a representative with the Special Power of Attorney. My wife did it for me. Good am, Is there a chance to change the major like soc. Sci.instead of TLE major as a repeater. kelan po ba ipost ang mga ratings? when i did the online application for let the only option that shows on my existing transaction is "cancel' no payment details etc. normal po ba un or did i miss a step? Hi, magfile po ako ng LET at the same time magfile den po ako sa CIVIL SERVICE exam, hindi ba ma aapektuhan ang pagfile ko sa LET exam sa pagfile ko ng CIVIL SERvice exam ? anyone can answer me? Hi, kailan pwede mag file Sir/ Ma'am? Hi, I took LET way back 2004 but failed and planning to take LET again, am BS Math graduate but prefer to take elementary education since it is my passion, have acquired 18 units supplemental Education already am i allowed to take Licensure for elementary education? Pm. saan po ba dito sa bacolod mg file exam,AT WHEn po. thanks. pra sa september 2017 board? help po paano mg change ng exam location sa online? ganun din po ang problema ko... ano dapat gawin? hello po may sa cagayan parin po ba mag exam ng LET? Hello po!! may sa cagayan po ba let exam? May I know po kung kelan nyo irerelease yung grades ng nagtake sa LET MARCH 2017? thank you. Good Morning po ask ko lang po kung kailan ang deadline ng filing ng mga repeaters for September let exam? good morning.. kelan po ang last day of filing para sa mga repeaters?? thank u po.. I have filed for March 2017 LET exam but was not able to take the exam due to an emergency reason.Do I still need to pay the P900 processing fee if I file in a satellite ofc (Robinsons)for September 2017 LET exam? Is it possible that your mother will be the one to apply for you? because you are not at the Philippines in the date of final filing? Good morning . i find it difficult po to register online since the site requires me to fill the date and rating for my previous examination. My problem is that this is my first examination to take. What should i do? thank you so much. tanong ko lang po kung ano yung kailangan ko ipresent kapag nagfile ako for LET? may mali po kasi sa NSO ko..Mali po yung gender ko na nakalagay. "Female" Po ako pero "Male" yung nakalagay sa NSO ko.First time ko po magfile. hi. nakapag file ka ba kahit may mali? Helo po..sna mi ssagot s tanong q plzz...graduate point aq ng BEED last 2005 at never p po aqng ng take ng LET dhil po s mali ung spelling ng family name q pro 1 letter lng nman ung mali..pro ngayon married na po aq need pba tlaga ung birth certificate q or marriage contract nlng? Plz po s mi mkasagot s'kin gusto qna po e try mg take ng Let..thank u po s mkksagot..
Hi good day everyone! May I ask if allow parin po ba mag take ng LET ang mga unit earners? and also kung meron po bang schedule of exam this year here in puerto princesa? thanks a lot guys have a great day! anu pong pdeng gawin kapag late po ang release ng tor?.july 18 pa po kasi ang release..gusto ko pong mkpagfile this time..
hello good day po, tanong ko lang po kailan po ba talaga yong deadline ng filling ng mga repeaters po i already check the prc calendar peru hindi po siya indicated. please kong sino po nakakaalam please reply. tnx. Hi. I want to ask if repeaters and first timers have the same deadline of filing? In addition, if PRC is still open even weekends ? Thank you. hello i just wanna ask kung ano po dapat gawin kung mali po unng nailagay na examination place, sa paf file online. salamat po.. please answer. if Already paid na po pwd ka pmunta sa malapit na PRC Regional Office sa inyong lugar. pwede po bang iba ang maglakad ng requirements for applying LET? available major courses for the secondary?? is it necessary to fill up an online appliction? yes po..appointment po yan..d ka aasikasuhin pag wala kang appointment...just like kukuha ka ng Passport at NBI,..
Im an AB English graduate can I take the BEED exam? Question 1: when will prc go back to tarlac city in metrotown mall to accept prc exam applications? Question 2: what date of appointment should i choose online if i plan to go there on that day? Hello po..pwd po ba mg.tanong?repeater na po aqw tapos bagong kasal po aqw last may,ano po ba ang ma dag.dag na requirements?or kailangan ko pa ba dalhin ang marriage contract?yan lng po kasi ang merun aqw ngayon kc wala pa po aqng NSO birth.cert.sana po may mkasagot..malaking tulong na po..salamat! for Marriage applicant: NSO Birth Certificate and NSO Marriage Certificate po. hi, taga Butuan po ako. ang malapit lang na examination center dito ay ang CDO at Davao. kaso may haka-haka na baka wala daw CDO at Davao this BLEPT September 2017 dahil sa Maute kase daw malapit lang sa Marawi. may possibilities po bang walang CDO at Davao examination center? Compsci grad ano po ung itatake na major sa let? ask ko lang po kung paano magbabayad para sa mga repeater ng LET? at kung saaan po? is it really necessary to fill up an online application? Yes po...it need na po mag online ka at e print mo application para walang hustle and uunahin ka talaga nla. Kung hindi po ba successive ang pgtake nang exam ok lng po ba ? At same pa rin po ba mga requirements , ng stop po kasi aq for 2 years n po. HELLO PO,,,WHEN WILL BE THE DEADLINE FILING FOR REPEATERS..THANK YOU SO MUCH! kailan po last registration ng mga repeaters for let sept 2017? Gud am.ask lang qo mam/sr.sa regstration online,di vha po may nakalagay na puede tayo magbayad through bayad center sample,if ngayon po aqo magbayad dn dapat po vha ngayon dn aqo magpa process sa near prc?di vha deadline po is july 14 pa...pls answer any idea. May deadline din po ba ang online registration? Maraming salamat po! What are the accredited bayad centers of PRC Ma'am/Sir? kailangan po ba ng good moral sa pagpapasa ng requirements para sa LET? Thank you. Kailan po deadline ng online application? Ask ko lang po pag BS Information Technology po ano po ba Major? Nawala kasi original tor ko(due to habagat) but i have my photocopy. Ok lang ba un as repeater? Mejo talagal kasi pag request sa school,hndi na aabot sa deadline. is it possible na makapag apply since wla pa yung TOR namin from PUP. i dont know what happen but the whole batch ay wala pa at ang problema ay from main campus. we really want to apply for that yet wala kaming TOR. is it okay kung kukuha kami ng letter from the school na nagpapatunay na sa kanila ang fault at hindi sa amin and ipafollow up nalang ang TOR. Good afternoon po. Repeater po ako, nag attend po ako noong march 26 2017, hindi po ako nakapasa. Paano po ako maka file ulit kung nawala ung Last na NOA ko? Hi po. Pwede po bang gamitin ang 2016released copy ng ToR for this coming LET2017 application? Dko kasi xa nagamit taz d ako nakauwi para makakuha uli ng copy.. TIA. First timer here. I'm a fresh graduate of BEED (June2017). my name in my TOR is still my maiden name. And I've been married since 2014. Do I need to have an affidavit to process my application? or just my marriage certificate from PSA? extended po ba ang filing sa LET? pwede po ba magfile sa prc kahit hindi sundin yung schedule?? july 14 pa schedko,pwede na ba ko bukas magpasa ng requirements? hello! yung passport size id pic ba kailangan complete name including middle name or middle initial lang? is it ok that my filing place is not the same as my examination place? Is there any extension with regard in filing for the said LET exam? Nag apply po ako online....sa regional po l...pede process application sa ossco clark? Ask lang po. If papayagan pa kaya nila ako mag file sa Friday even if my appointment date is on Thursday? Good evening po. Ask lng po kng pwd ba mkapagtransact sa prc davao kng ang nakuha mong sched ay sa cdo. due to financial problems po kc hnd ako mkkapunta sa cdo. hope na may magrespond. May application di na approve due to error in my middle intial. I would like to ask if pwede ba makuha ang registration fee na binayad na 900? May extension pa ba sa application? undergrad q po ay HRM, then unit earners po ako, anu po ba ang major ko pagmagtake ako sa LET??? Pwd pa ho ba mkahabol ng filing for let after july 14? may extended po ba ang filling ng LET EXAM dito sa manila? GOOD MORNING PO..,Ask q lng po f my extension pa po ba ang filling ng LET EXAM? Pwd pa ho ba mka habol ng filing after july 14 pra sa sept let? Pls reply po. Pwede pa po bang mag extend yung registration for LET s manila? Hello po, sana po may makapag comment or advice po sa problem ko. thanks in advance. Ganito po kasi 'yon I'm from E. Samar at dito po ako nagrereview sa Manila at nakapag file na po sa PRC for this Sept LET, gusto ko po sanang sa Tacloban nalang mag exam, pwde ko po ba 'yong ipabago 'yong place of examination ko? graduate po ako ng B.S in AGRICULTURE ma method po sana ako... pagnatapos ko po ang method pwede po ba ako magtake ng LET? at ano pong specialization pwede sakin? Hello, tanong ko lang po same lang po ba ang pi-fill up-an sa online registration ng repeater at first timer? Kase me nakapagsabi po sakin na kelangan pa daw po yung ave.sa LET before mag file. pwede po bang mag file sa manila tapos sa cdo mag take? Hi.. Please somebody help me.. I lost my noa for LET yesterday .. The exam is on march 25 na 🙁 .. Ano po pwedeng gawin?? what if after online registration system is asking for you to choose a center na kaso no available dates for appoitment , can i still go walk in w/out an appointmnt?